August | 2010 | Lipogram! Scorecard! It’s not as if it’s an original story, I worry. Shouldn’t a young kid bring his own quirks, his own idiosyncrasy? A goofy windup, a cool pitch? Or is such a frill just a way of disguising an old plot? And it’s not as if anybody would want a totally odd string of affairs. Sports’ laws build in norms, only allowing mildly variant actions. Should a cunning coach find a way around any of it, bigwigs will codify that no, in fact, you cannot do that. This maintains a fair way of playing. Or, a drastic lack of pitching/hitting parity will prompt a switch (1968). Looking back throughout history, you can watch months form clumps of similar ways of playing, still staying within rigid forms but changing slightly until what you and I know today is put down in ink. In such a long span of history, many stars stand out. Many start slowly, many start quickly. Many play for a long duration; not all do. All bring an individual story, an arc, a plot. But thinking about many, you can group stars too into similar clumps. Just in my conscious sports-watching days, things vary. Artificial All-Star drama–“Oh, this counts! It’s important! Uh-huh!” is not that old. Instantly watching film to fight callings is also not that old. Still, I’m not so old as to know how it was during a major variation, nor during a squad’s total introduction. Though I do know about a squad moving to a distinct city. Country, too. And do much of it in just months? Slow down. I don’t know how this will finish. But I’m afraid. I’m not sure when, if ever, I’m going to post the poem I wrote from, roughly, midnight to 12:38 am on Thursday morning. It doesn’t have a title yet. But I’m putting the first stanza up now so it’ll jog your memory and you can go “Oh, this must have been the day after the Derrek Lee trade and two days after Bobby Thomson died” or whatever if I ever post it, perhaps in edited form. Usually I try to react pretty quickly, so I wanted to let you know I’m still doing that. Despite the Nash-esque meter or lack thereof, however, this is pretty dark in overall tone. That’s worse, very often, then daring to win. Of the NL Central, then good for their town. We’re strength against strength, not slackers versus gritty. But it’s not that easy to get me to hate. …sorted by the first appearance of their titles. There were a lot of judgment calls. “Never, but that’s okay” consists of instrumentals and non-songs. 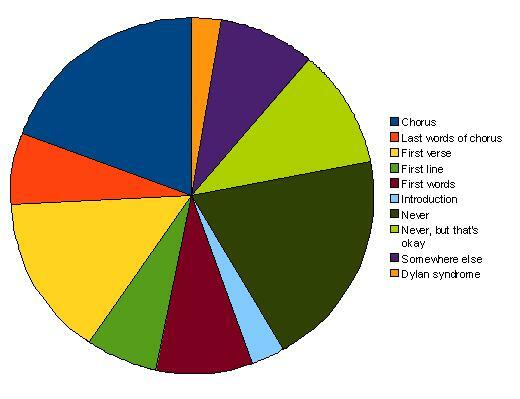 The opposite condition, “Schwartzitis”, happens when the title appears in a part of the song that is musically independent from verses, reappears between them like a chorus should, and has repeated words, but so few repeated words that it barely counts as a chorus, and I call it a chorus anyway. This is not big enough a category to deserve its own piece of the pie graph. Packs enhance one’s performance (on the field). Larger than life in magnitude and weight. Nobody really knew they had to wait. See brilliance, but all over the field. Both with the exuberance of a child. But it’s more than just a game for a child. With no other care. Oh yes, they just might. That we had seen, watching from near the field? Who is this man with all this excess weight? When baseball was like this? Time will not wait. I must face more than what was on the field. Might someday have become the greatest one. The wonder child joins them with new zeroes.